Love is in the air and Valentine’s Day is the perfect time to get hearts racing. 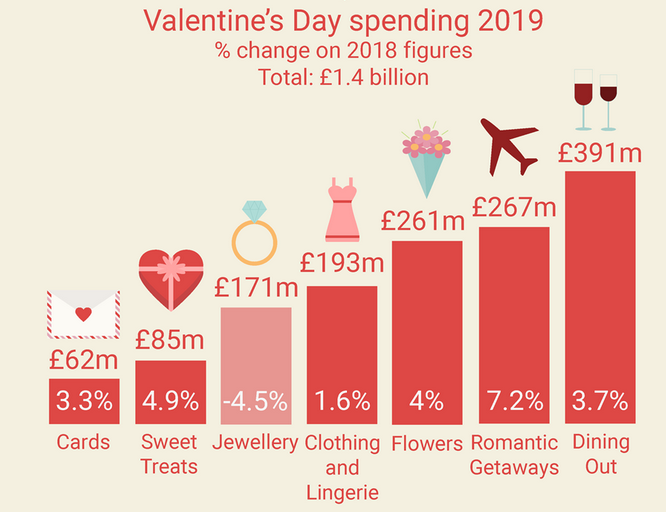 Consumers in the US are predicted to spend a whopping $30 billion on romantic treats this year with the UK splashing out £1.4 billion on their nearest and dearest! 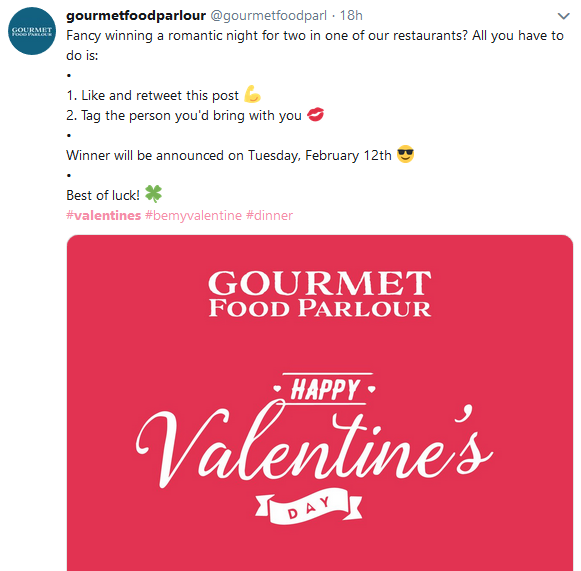 #ValentinesDay – How to do Valentine’s Social Media. Technology is playing a key role too. Last year, 36% US consumers used their smartphones to research products and compare prices alongside 44% who turned to their tablets. Having an online presence is therefore a vital way to tap into the increasing number of people buying Valentine’s gifts on the internet. According to an international survey by One Hour Translation, an impressive 31% of participants bought a gift online. Italians came out as the most prolific online shoppers of 11 countries surveyed, with 23% taking the ecommerce option. Valentine’s is a natural marketing opportunity for many brands such as those selling confectionary or luxury gifts. But, the most romantic day of the year is also a chance for other companies to think outside of the box and board the love train. Here’s a plethora of successful and well-presented social media marketing campaigns that will give you some ideas. We’re not claiming to be love gurus. That’s for sure. But when something is enticing, you want to find out more, right? So, this is a great place to start. 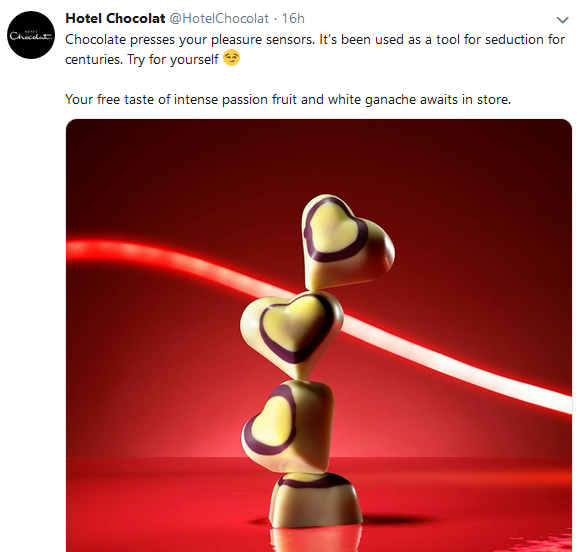 Hotel Chocolat have hit the nail on the head so far this year with their Valentine’s teaser which are getting everyone in the mood for something a little sweet! Marketing Takeaway 1: This first tweet dates back to the end of January; a time when people generally need a pick-me-up and something to look forward to – great timing guys. Marketing takeaway 2: Look at the colour scheme. Red, for love. This image is bright, bold and unmissable when scrolling through a crowded social media platform like Twitter. Marketing takeaway 3: A link to an article describing why we celebrate Valentine’s day is enticing content. 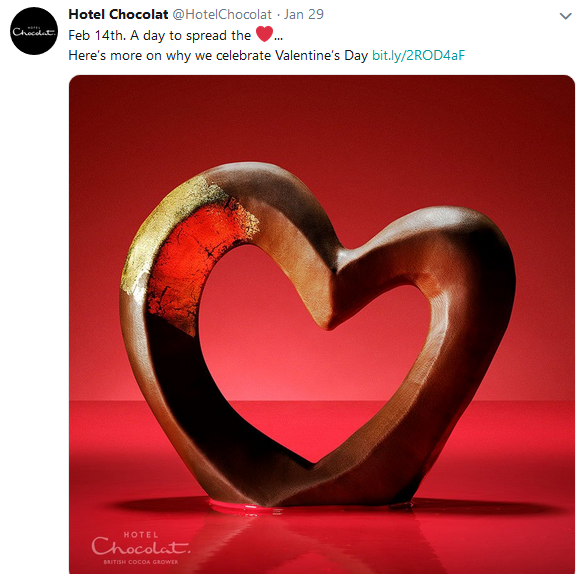 Many people won’t know the history of Valentine’s and will want to know more by heading straight to the Hotel Chocolat site. On the article landing page, the first thing you see is an easy navigation tool taking you to other parts of the site, therefore encouraging you to stay around longer and potentially make a purchase. Genius! This second tweet from the same brand is equally as enticing. Marketing takeaway 1: The colour scheme and heart imagery are consistent across the campaign helping to grab attention. Marketing takeaway 2: While the first ad was very much a promotion of their online site, it was quickly followed up by encouraging people to visit their brick and mortar stores. How? Through giveaways and freebies. We all love them, right? This is a fantastic example of offline marketing supported through and online campaign. Valentine’s Day is for loved up couples! Of course! While you should certainly cover this angle, could there be a market you’re well and truly missing altogether? Love exists in many different forms and there’s no reason why all varieties can’t be celebrated on this special day! Marketing Takeaway 1: Tap into a new audience. 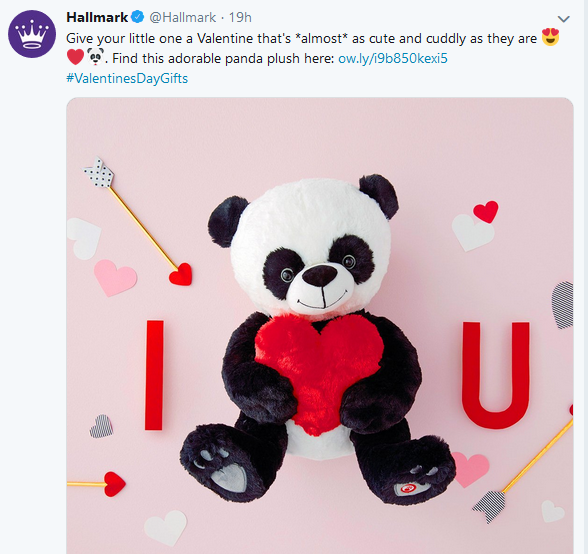 Hallmark are running a campaign for couples, but they’ve added an extra cute touch by promoting this panda plush. The Twitter campaign is very much targeted towards parents due to the wording “give your little one”. It’s a call to action which pulls on the heartstrings. The accompanying link also makes it difficult to say no. Marketing Takeaway 2: Choreograph a multi-channel campaign for maximum exposure. Hallmark have a strong presence on Facebook and Instagram, with their Facebook marketing calling for consumers to give ‘little hears’ something to ‘love.’ All imagery used is consistent to ensure the campaign has a strong identity. Marketing Takeaway 1: There’s a prize up for grabs. But there are also a series of conditions designed to increase brand visibility and extend outreach. Essentially, those who don’t take the required actions won’t have a chance of winning, so there’s a real incentive to take part. Marketing Takeaway 2: This post features three popular hashtags which make it instantly searchable. This in itself will help the post to reach the eyes of those looking for specific #valentines content. Marketing Takeaway 3: The post includes a graphic wishing people a happy Valentine’s Day! This is a clever marketing technique as the bright colours and larger text draw attention to what’s written above making it really hard to skim content. The post is also much longer than it otherwise would have been and is therefore easier to notice. Valentine’s Day is rapidly approaching, but if you’re scrambling about last minute, don’t worry! Remember 32% of Valentine’s Day purchases are made the week of the holiday so there’s still plenty of time. That said; making the most of important calendar dates is important and therefore big events should be scheduled into your marketing calendar. How is your brand celebrating #ValentinesDay ? Tweet me @Charli_Says or contact me for social media management pricing.